Leanplum offers a mobile marketing platform with solutions for mobile messaging, in-app experiences, and detailed analytics. Messaging: Send push notifications, in-app messages, email, and more, using wide broadcasts or personalized content. Deliver messages with "triggers or drip campaigns across the customer lifecycle". Other targeting strategies include "onboarding, engagement, conversion, reactivation, and loyalty" Leanplum, 05. Mobile Marketing Automation: Create "context-rich campaigns that understand and respond to user actions". Target users based on "what users do and who they are", and engage along the full customer journey. Tailor interactions based on behavior, location, timing, and channel. Automate self-activating messages in response to "personalized behaviors" Leanplum, 06. App Experience Command Center: A mobile content management system Leanplum, 07. 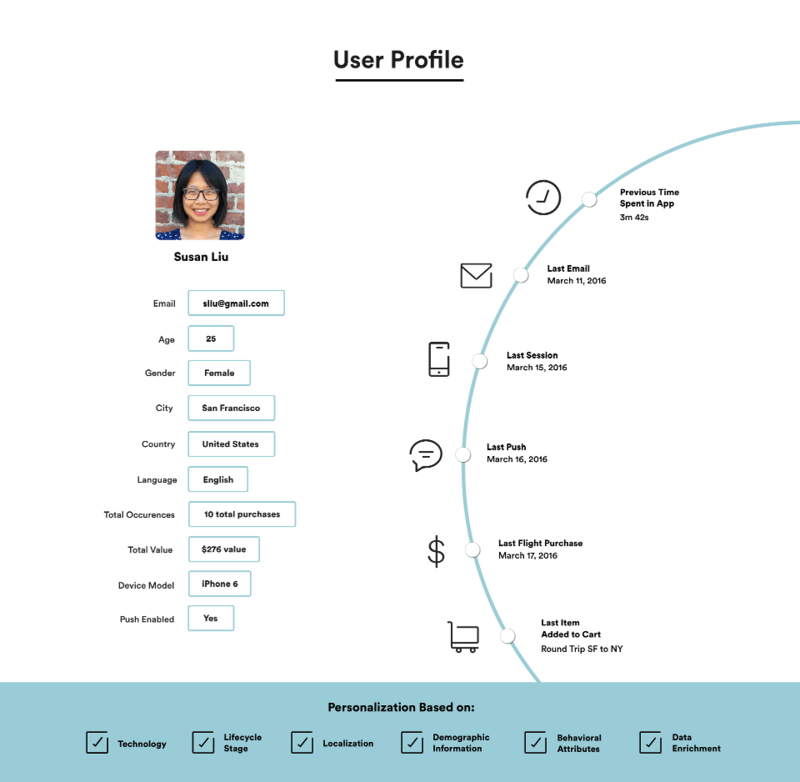 App Personalization: Leanplum "provides context and personalization enabled by individual user profiles that get richer over time. Demographic, behavior, location, time, and external data provide the deep insights that power relevance. The key to meaningful engagement is understanding who users are and what they do inside your app." They "capture limitless user events and behaviors to fuel highly contextual messaging campaigns" Leanplum, 08. A/B Testing: Leanplum claims to have "the most extensive mobile A/B testing solution in the industry". Their product "comes equipped with the ability to run A/B and multivariate tests" to maximize return on investment Leanplum, 09. Analytics: Leanplum's approach is to "capture all events and behaviors associated with a user, without limits or data point costs" in order to "inspire real-time action". Clients can "customize parameters, reports, and metrics". Insights examine "engagement, retention, revenue, uninstalls, and more" Leanplum, 10. Leanplum gathers detailed user profile information and correlates with behavioral data Leanplum, 11. Their platoform is "built on a foundation of A/B Testing and Analytics" to deliver "deep customer understanding" Leanplum, 12. PII collection: Leanplum collects both PII ("personal information") and non-PII data. They collect information that is voluntarily provided (eg, through email newsletters, accounts, or profiles users sign up for), passively provided (eg, IP address, mobile device ID, server logs, cookies, web beacons, user actions like clicks, and so on). Third party collection: Leanplum "may receive information about you, including Personal Information, from third parties (e.g., opt-in lists where you have requested information about Leanplum or the Service while visiting a Third-Party Site). We may combine this information with other Personal Information we maintain about you. If we do so, this Policy governs any combined information that we maintain in personally identifiable format". Data sharing: Leanplum states, "Except as described in this Policy, we will not disclose your Personal Information that we collect on the Service to third parties without your consent. We may disclose your Personal Information to third parties if you consent to us doing so, as well as in...circumstances" involving service providers, business transfers, the protection of Leanplum's interests, and public authorities. Opt-out: Leanplum offers an ability to opt out from the disclosure of information to third parties, as well as for use cases that are "incompatible with the purpose(s) for which it was originally collected or subsequently authorized". Individuals must contact Leanplum by email to exercise their choice. Access and retention: Individuals with user accounts or profiles on the Leanplum Service can email Leanplum requesting access to their Personal Information; they can also request to amend or update the data. Users can also request Leanplum delete their data. However, Leanplum states they "may need to retain some of your Personal Information in order to satisfy our legal obligations, or where we reasonably believe that we have a legitimate reason to do so". International law: Leanplum states it is in compliance with the EU-U.S. Privacy Shield and the Swiss-U.S. Privacy Shield. Security: Leanplum states it takes reasonable security measures, but also states that "no data security measures can be guaranteed to be completely effective. Consequently, we cannot ensure or warrant the security of any information that you provide to us. You transmit information to us at your own risk" Leanplum, 13. Financial details: Leanplum was founded in 2012. It has raised over $93 million Crunchbase, 01. In November 2017, it raised $47 million from investors. The company was founded by former Google engineers Business Insider, 01. Scope: Leanplum says it handles 14 billion events per day. Infrastructure: Leanplum built their service on the Google Cloud Platform "to optimize for fault-tolerance and availability" Leanplum, 04. Grab - Transport, Food Delivery, Payments 5.41.0 April 20, 2019, 12:08 p.m.
Firefox for Android Beta 67.0 April 14, 2019, 9:53 a.m.
Plex 7.13.0.9583 April 2, 2019, 6:09 a.m.
Lingvist: Learn Spanish, French, German & more! 2.33.14 April 2, 2019, 6:05 a.m.
Yousician - Learn Guitar, Piano, Bass & Ukulele 3.5.0 April 2, 2019, 12:10 a.m. Grab - Transport, Food Delivery, Payments 5.37.1 March 30, 2019, 7:07 p.m.
Too Good To Go - fight food waste, save great food 19.3.1 March 30, 2019, 1:10 a.m.
Firefox Browser fast & private 66.0.2 March 28, 2019, 4:13 p.m.
Photomath: math made simple 5.1.0 March 27, 2019, 9:24 p.m.
Opera Browser: Fast and Secure 51.1.2461.137501 March 26, 2019, 7:38 p.m.
Wattpad 📖 Where stories live 8.5.0 March 19, 2019, 11:40 a.m.
Plex 7.12.2.9471 March 19, 2019, 10:46 a.m.
IMVU: 3D Avatar! Virtual World & Social Game 4.11.1.41101003 March 19, 2019, 1:56 a.m.
Opera Mini - fast web browser 39.1.2254.136743 March 18, 2019, 1:13 a.m.
Plex 7.12.1.9314 March 12, 2019, 7:05 a.m.
Lingvist: Learn Spanish, French, German & more! 2.33.4 March 12, 2019, 1:05 a.m.
Yousician - Learn Guitar, Piano, Bass & Ukulele 3.4.0 March 11, 2019, 7:17 p.m. Grab 5.35.0 March 9, 2019, 7:08 p.m.
letgo: Buy & Sell Used Stuff, Cars & Real Estate 2.7.3 March 5, 2019, 1:09 a.m.
My Data Manager - Data Usage 8.0.2 March 1, 2019, 1:15 a.m.
Home Street – A House Design Game 0.19.4 Feb. 26, 2019, 10:11 a.m.
Too Good To Go - fight food waste, save great food 19.2.2 Feb. 24, 2019, 10:46 a.m.
Opera Browser: Fast and Secure 50.2.2426.136249 Feb. 23, 2019, 1:09 p.m.
Plex 7.10.0.8875 Feb. 17, 2019, 7:08 p.m.
Yousician - Learn Guitar, Piano, Bass & Ukulele 3.2.0 Feb. 17, 2019, 7:10 a.m.
Lingvist: Learn Spanish, French, German & more! 2.32.12 Feb. 17, 2019, 7:08 a.m. Grab - Transport, Food Delivery, Payments 5.32.1 Feb. 15, 2019, 1:08 a.m.
Firefox Browser fast & private 65.0.1 Feb. 13, 2019, 11:27 p.m.
Opera browser beta 50.0.2425.135970 Feb. 9, 2019, 1:21 a.m.
Invoice & Estimate generator - Invoice 2go 10.64.1 Feb. 4, 2019, 1:13 p.m.
Firefox for Android Beta 65.0 Feb. 3, 2019, 8:45 p.m.
Star Trek™ Fleet Command 0.543.8939 Feb. 1, 2019, 10:12 p.m.
Firefox Browser fast & private 65.0 Feb. 1, 2019, 7:17 p.m.
토스 4.0.2 Feb. 1, 2019, 11:27 a.m.
Too Good To Go - fight food waste, save great food 19.1.1 Feb. 1, 2019, 7:47 a.m.
Udemy - Online Courses 5.5.1 Jan. 29, 2019, 1:26 p.m.